Product Category: Horse Racing Software Tools. Racing Synergy is a horse racing betting tool by the "Betting Automation" team. It is a PC software implementation of the BetSynergy Horse Racing Method which I have been using for many years to make a very healthy profit. The Racing Synergy Software has made my job a whole lot easier! If you haven't grasped this 'value price' concept already, then please, I beg you to investigate this urgently as its the only way the majority of punters will profit long term unless they have some seriously good insider information. It stands to reason that if you are able to back horses at 10/1 many times when their true price is 8/1, you will be in profit long term - no ifs no buts! Below are my results for the 2012 racing season (Widely accepted as a terrible year for horse racing punters due to the adverse weather conditions through spring right into summer). 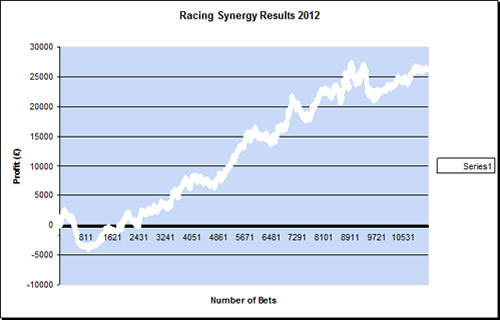 I still took over £26,000 in profit from using Racing Synergy in 2012. Racing Synergy is a small efficient software tool that quickly scans all UK / Irish races you choose at warp speed to find Value Horses. It works on all race types including handicaps / non handicaps, small fields, large fields, NH, Flat etc. On an average UK race day with around 3 racecourse meetings it might highlight around 15 to 30 horses that match the value criteria. You can then use the information to bet in whichever way best suits you. E.g. Outright WIN, EW, Arbitrage, multiples, dutching etc. If preferred, you can limit the number of value horses found by specifying numerous configurable criteria within the software. Select that only the very best rated horses are to be found (Configurable range of ratings to suit all needs). Specify odds range in which to cover so that the software ignores horses outside the odds range. Specify WOM (Weight of Money) requirements so that you can be sure the selection has enough interest behind it. Selecting which races to cover. You can choose the UK / Irish races to scan each day from a list. Useful should for example you wish to exclude certain race types (hcp / non hcp etc) or maybe if NR's are affecting a particular race. Using the available settings, you can easily tinker to find your ultimate profitable solution. The help guides / Racing Synergy website shows you how to configure the software to match your requirements and its very easy to do indeed! The software is provided on a licence basis and is immediately downloadable upon purchase. A licence key will be provided to grant you full access to the software for the term you purchase. Licence terms are available to suit everyones budget with the cheapest being a 1 week term (perfect for trying the software out) and the longest being a full year. The longer the term you purchase, the cheaper the software works out. Video examples of the software in use and further information can be found on the Racing Synergy website. What Resources Do You Need for Racing Synergy? In order to use Racing Synergy, you simply need a PC with access to the internet. The PC should be running Windows Operating System. Obviously, the more RAM / Processor speed you have available, the better. You will be placing your bets with traditional bookmakers and you can do so using their online sites or via telephone. You should have accounts with as many of the leading and safe UK bookmakers as you can as this will maximise your profit potential. NEVER accept a lower price with one bookie just because you haven't got an account with the bookie offering the higher price. Simply open an account with the other bookie(s). If you don't already do this, you are throwing money away and could easily end up losing long term rather than profiting! A couple of very minor things here. Firstly, the software does rely and a couple of other major internet betting sites in order to function (To gather bookie prices that are available etc). So if they are not available or are down for maintenance etc, then the software will be unable to function. This has only happened to me on a couple of occasions and usually the 'dead' site(s) are back online within an hour or two allowing the Racing Synergy software to function again. The 2nd point is not actually a gripe with the software but that you do need to dedicate a reasonable amount of time if you intend to follow the RacingSynergy Software seriously. The reason for this is that the software is constantly scanning the races and taking advantage of the movement in odds to locate and calculate which horses are selected. The horse racing markets are ever changing throughout the day! If you are only able to spare 15 minutes a day in your lunch hour, then I would probably not recommend the product to you. A better alternative in such cases would be the Value Horse Method. If however you can spare a full hour or more or only want to bet over the weekend when you are available, then Racing Synergy is definitely for you. The Racing Synergy horse racing software is an excellent product from the Betting Automation team. It will highlight many value horses each and every racing day. Obviously, they will not all win but by virtue of the fact that most of the prices you will be getting are higher than the true price for the horse, you will win long term. My results for the past 3 years have proved just that. This software is a must for the serious bettor and investor. With prices for the software starting at just £29, its not going to break your bank. If you want to make money from horse racing then you simply must use this software. HOW GOOD IS THIS METHOD? - Take a look at my Bookie Account Closure Page NOW... This shows examples of some of the bookmakers that have shutdown my accounts simply because I use Racing Synergy... If that isn't a testimonial, I don't know what is! WANT MORE PROOF? - Take a look at some of my sample Racing Synergy Bank Statements, Showing transactions going to and from bookies.